Hosta *ISLAND BREEZE*: Bright Yellow w Dark Green Margins! An oldie but a goodie, Herman's Pride Variegated Yellow Archangel is the right answer for shady areas. 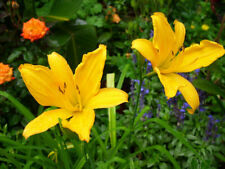 The deep yellow flowers of Lamiastrum cover the eye-catching silver and green checkered foliage in spring.